Microsoft passed out the Technical Preview bits to TAP partners, and like clockwork, the bits leaked out on the Internet. And like the Build Whore that I am, I went and downloaded it. There are scores of screenshots all over the net already, so there is no point in posting them here. 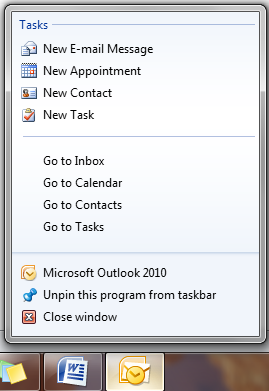 I do, however, have a screenshot that no one else has… Outlook 2010’s Jump List menu. I’ve only been using it an hour, and this single feature has already made me vastly more productive. WTG Office team! Exchange 2010 integration is nice. How's the quality feel? I can't get a feel for a product if I only run it in the sterile environment of a virtual machine, and I'd like to install if on my production machine to do some proper dogfooding. Does it have any issues that will destroy my system, scramble my files and kick me in the nads? I've been running Windows 7 and Office 2010 for a short while internally at Microsoft, and already it is painful for me to go back to Vista and Office 2007. Just wait until you see the rest of Office 2010, including SharePoint 2010, this is going to be a huge release.